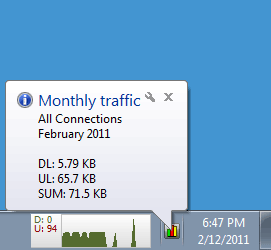 NetWorx is a freeware Bandwidth monitor. It could collect bandwidth usage data and measure the speed of your Internet. NetWorx monit traffice data of your bandwidth and generate daily, weekly or monthly report including received and sent data. NetWorx also allow you to export the report as *.xls, *.rtf, *.htm, *.txt or *.csv files. NetWorx allows you to monitor all your network connections or a specific network connection (such as Ethernet or PPP) only and help you detect possible sources of network problems. Note: Run networx.exe to launch NetWorx Portable. NetWorx Portable was updated to version 5.2.9 on 2013/7/29. What's new in NetWorx 5.2.9? Updated LAN traffic filtering driver (now uses Windows Filtering Platform on Windows 7 and above). This entry was posted in Internet Tools and tagged Bandwidth Monitor, Network Monitor, NetWorx, networx portable, Speed Meter. Bookmark the permalink.